Place all your dry ingredients into a6 quart slow cooker or larger and toss to mix well. 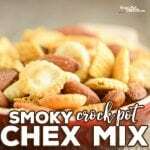 Combine butter, Worcestershire sauce and liquid smoke and drizzle over the top of your snack mix. Toss to coat and cook on high WITHOUT the lid for 90 minutes to 2 hours, stirring well every 30 min to prevent burning. As with all our recipes, nutritional values (including calorie counts) will vary depending on the exact products you choose to use. This recipe calls for Liquid Smoke. You can either buy it online or find it in your grocery store near the bbq sauces. You will want to use a 6 quart or larger slow cooker WITHOUT the lid for this recipe. We used this slow cooker.